One of the most destructive habits in business is the fire drill. You know the scene: Frank the fireman fires off an email alarming the group to an urgent issue about a new competitor activity, anxious customer request or the next internal flavor-of-the-month initiative. This sets off a chain reaction of emails, teleconferences and meetings to handle the issue as quickly as possible. After several days or weeks of unplanned activity, everybody gets back to their planned work. Fires are generally not a reason to change strategy. However, you may have some managers who are all too eager to don the helmet and hose and swoop in to save the day through urgent, but unimportant tasks. The problem with this firefighting mentality is the opportunity costs it bleeds from your business. Time, talent, and budget spent on fighting urgent but unimportant fires are resources that can’t be properly invested elsewhere to support the successful execution of your strategy. Taking a few hours here and there each week to attend to fires might not seem like a big deal, but it is. Take those few hours a week and multiply that by the number of managers in the organization. It’s quickly evident how thousands of hours a year can be wasted with no way to regain those precious resources. The key to eliminating a bad habit such as the fire drill is to replace the routine, or behavior, with a more positive or productive one. By keeping the same cue (fire pops up) and same reward (successful completion of goals), this shift in the routine can transform the bad habit into a good one. When the cue or fire triggers the habit, we need to replace the current routine—a flurry of unplanned activity—with a new one. A phrase as simple as “Let’s think about that,” can fill the routine. This phrase reminds people not to just react to the fire, but to consider it relative to the other planned initiatives currently being worked on. Do we really need to attend to this? Does this fall within our responsibilities? Who can handle this more efficiently? How did this fire start in the first place? 1. Establish goals. One method of preventing fire drills is to have your set of 3-5 goals and corresponding strategies written down. When a fire pops up, ask if it relates to the 3-5 goals and strategies. If not, then it’s potentially something to not attend to. If your goals and strategies are not written down, it’s much more difficult to determine the validity of the fire at hand. 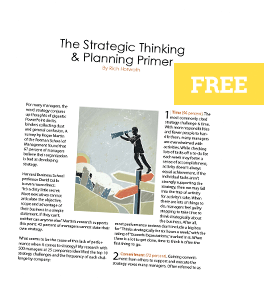 Develop a 1-2 page visual plan such as a StrategyPrint, or blueprint for your business, to link your strategic plan and daily activities. Too often, strategic plans are sitting on shelves in binders collecting dust or buried on one’s PC in a mammoth PowerPoint deck. If strategy is not driving your daily activities, then in reality, you don’t have one. 2. Prioritize. A great cause of frustration among managers is the overall lack of priorities at the leadership level. When everything is deemed important, it creates an overflowing-plate syndrome. If clear priorities are not established up front, then it becomes difficult for people to determine what they should be working on and why. This lack of priorities prevents people from taking things off of their plate, resulting in the frustration of feeling spread too thin by too many initiatives. A lack of priorities is a red flag that the difficult work of making trade-offs—choosing some things and not others—was not accomplished in setting the strategy. Good strategy requires trade-offs, which in turn help establish priorities by filtering out activities that don’t contribute to the achievement of goals. 3. Fire Prevention. A Fire Prevention approach can help you extinguish some of the recurring fires by taking action on the things that ignite them. Examples of internal fires include leaders demanding lists or reports that require time, labor, and energy to put together, versus those that can be automatically generated; flavor-of-the-month initiatives that aren’t directly related to people’s strategic plan; and attendance on teleconferences that have no direct business value for the participant. Examples of external fires include the same customer continually asking for activities to be performed in a much shorter time frame than normal; requests for proposal (RFP) that don’t match up with your business acquisition criteria; and people outside the organization seeking teleconferences or meetings to discuss partnerships or alliances without first providing sufficient business rationale. Control: Invest resources the first time (and only the first time) a fire appears in order to control it, prior to further analysis. Delegate: Pass the resource investment requirement to a group or person with the appropriate accountability for such an event. Prevent: Determine and eliminate the root cause. Actions determine outcomes. If your team is constantly fighting urgent but unimportant fires, the lack of productivity will eventually be seen in your bottom line. Being a strategic leader may not appear as heroic as putting out fires, but it’s certainly more profitable.